I wouldn’t class myself as an expert in SSIS but I certainly know my way around but came across something today which I thought I’d share. As with a lot of things there are “many ways to skin a cat”, none of which is something I’ll go into at the moment but what i will concentrate on is updating columns in a table where the data has changed in the source. One of the projects I’m currently working on requires this very process and when i set about doing so I created the T-SQL Merge statement to do the business. 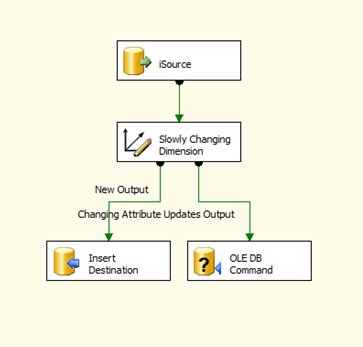 However, the question was raised as to why I didn’t use SSIS’s built in component Slowly Changing Dimension (SCD)? I didn’t really have an answer other than personal preference but decided to delve into it a bit further and compare the performance of each method. So we now have a source and target table with different Names and we’ll look to update the iTarget table with the information coming from iSource. Using this method simply in SSMS for simplicity, profiler output 2 rows for Batch Starting and Batch Completing, CPUTime of 125ms and Duration of 125ms and it updated 6678 records. Top stuff, as expected. 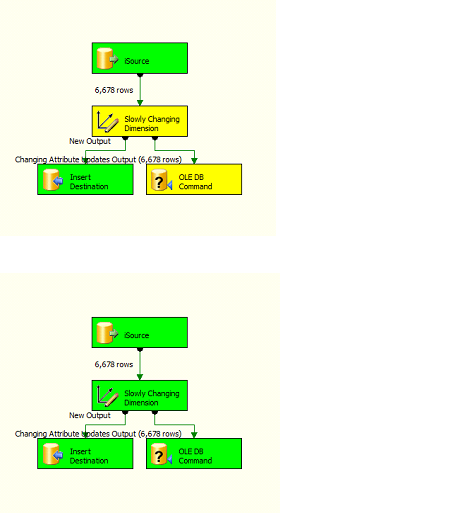 I clear down the profiler and run the ssis package and the outcome is quite astounding. Total Duration of 37 seconds (yes that’s seconds not ms!! )…….and this is on a table of only ~7k rows! Well I’ll be damned, the SCD basically runs a cursor looping each record checking for a match on ID and updating that record if so. I can’t actually believe that MS have built a component which performs in this way. So, to answer the question asked ” why I didn’t use SSIS’s built in component Slowly Changing Dimension (SCD)?”, I now have a definitive answer, it doesn’t perform! NOTE: This was done on SQL Server 2008R2 Developer Edition running on Windows 7 Ultimate, not sure if SQL Server 2012 has improved the SCD performance but I’ll leave that for another day.